Another paper cutter, you ask? Indeed, I say! 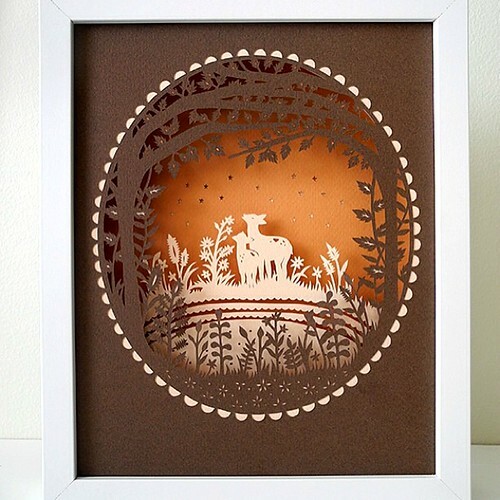 Sarah Trumbauer brings her unique touch to original and highly detailed cut paper designs. Leaves, flowers, art nouveau, children's stories and fairy tales... all are fair game. 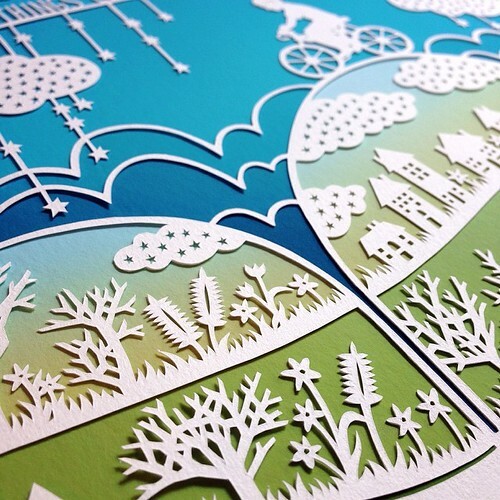 There's nothing like a gorgeous close-up to show the intricacy of a paper cutting... Sarah is also an avid photographer. ...and when complete, is enhanced with a graduated color backing paper. I was interested to learn she designs and prints the papers in her home studio - the very best way to obtain the desired effect. 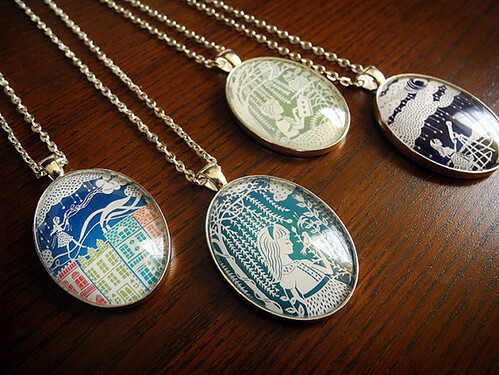 ...while miniature versions of cut paper scenes are printed, placed in oval pendants, and fitted with beveled glass. 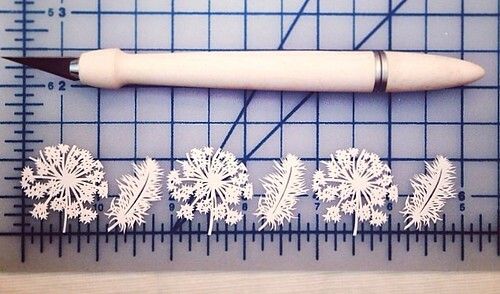 There isn't anything especially fancy about Sarah's tools... she relies on a Martha Stewart craft knife (watch her cut some impressively tiny stars in this very quick video) and changes the blade after each papercut inchie. What brought about your interest in this art? My mom‘s family is Pennsylvania Dutch and she introduced me to scherenschnitte when I was growing up. 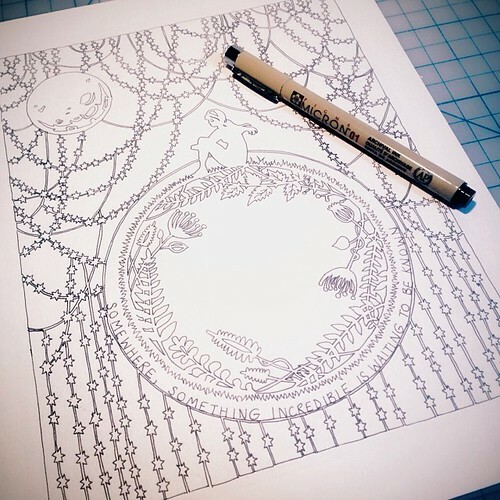 In college (Sarah is a graduate of Corcoran College of Art + Design in Washington, D.C.) I focused mainly on drawing and painting, but a few years later I started using it as another tool for my illustrations, and I fell head-over-heels in love. It went from being a hobby to something I've been doing full-time for about 3 years now. What do you enjoy most about the cutting process? 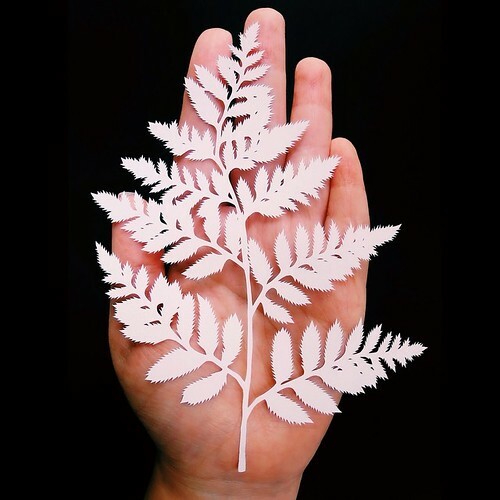 I love that with papercutting, I am creating something beautiful and meaningful using only an x-acto knife and a simple piece of paper. 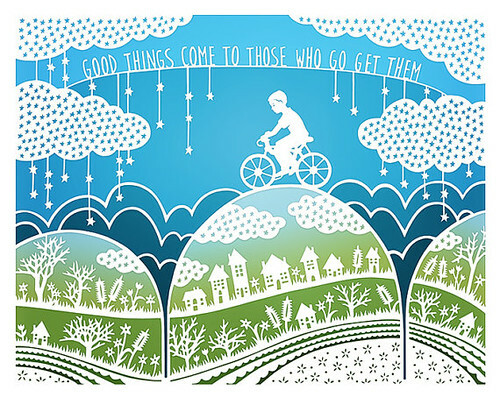 Watching the illustration develop from an intangible idea to a finished papercut, one cut at a time, really captivates me. I'm already looking forward to Sarah's winter/holiday designs. 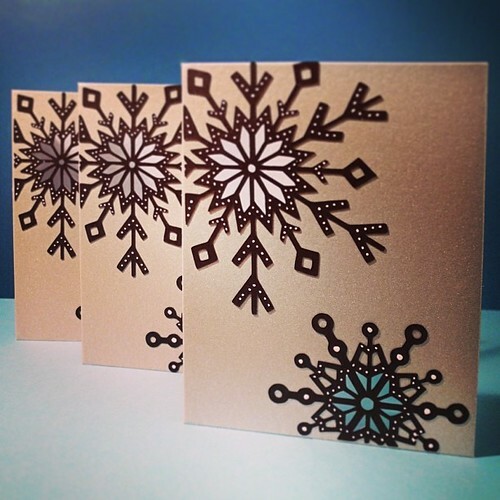 Recently she shared an ornament sneak-peek on Instagram and in the past has created beautiful cards. Due to a sudden deluge of orders this past weekend, Sarah regrets she is not able to accept requests for original designs at the moment. They will be offered again in several weeks, but meanwhile see many alternatives in her shop or via Facebook. SO beautiful! I absolutely love everything here. Thanks for sharing. A big huge WOW! 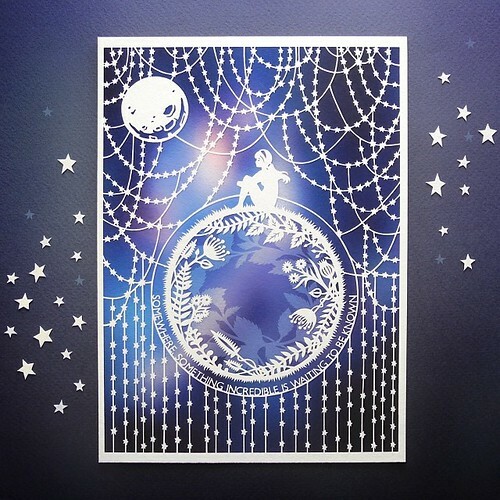 This is super super beautiful and delicate work! Thanks for sharing this Ann! 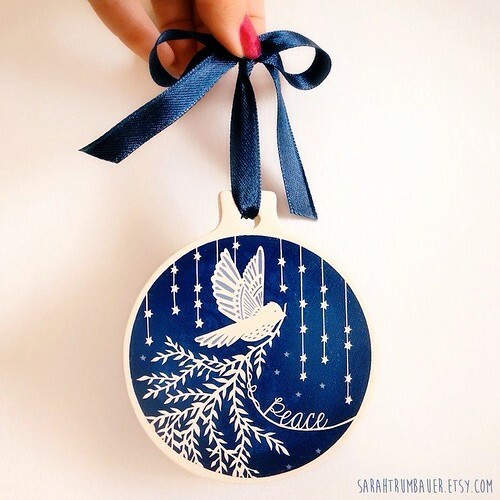 Sarah's works are MAGICAL! 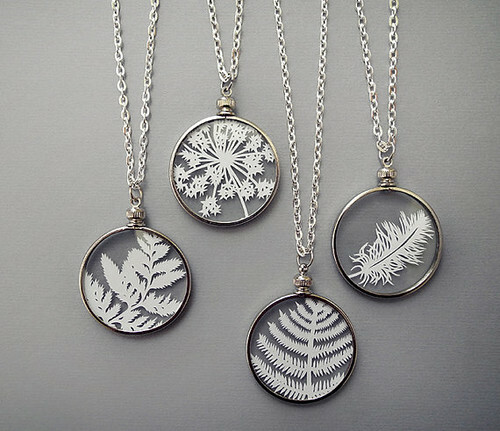 Paper cutting is already tedious, but the way she turns these pieces into wearable art is just amazing. Kudos to her. Breathtaking!!! . Her finished work looks so brilliant !! She is an amazing artist.